Recent federal court activity has dramatically changed the regulatory environment of campaign finance in the United States. Since 2010, the judiciary has decided that corporations and labor unions may freely spend in American elections, and that so-called “Super PACs” can accept unlimited contributions from private citizens for the purpose of buying election advertising. Despite the potential for such unregulated contributions to dramatically alter the conduct of campaigns, little is known about where Super PACs get their money, where they spend it, or how their message compares with other political groups. 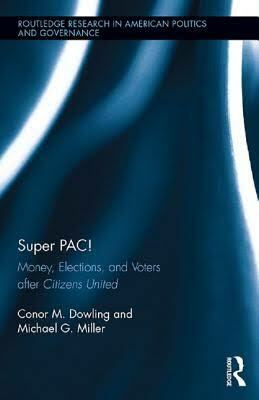 Moreover, we know almost nothing about whether individual citizens even notice Super PACs, or whether they distinguish between Super PAC activity and political activity by other political groups. This book addresses those questions. Using campaign finance data, election returns, advertising archives, a public opinion survey, and survey experiments, Super PAC! provides unprecedented insight into the behavior of these organizations, and how they affect public opinion and voting behavior. The first in-depth exploration of the topic, this book will make significant contributions in both political science and applied policy.